What is the Identity for Advertisers (IDFA)? The Identity for Advertisers (IDFA) is the individual and random identifier used by Apple to identify and track iOS user devices. As one of several types of device IDs, IDFA is one of the cookie replacements in mobile advertising, which has been continuously problematic for tracking in mobile mainly because it isn’t supported in apps and is disabled by default on Apple’s Safari browser. 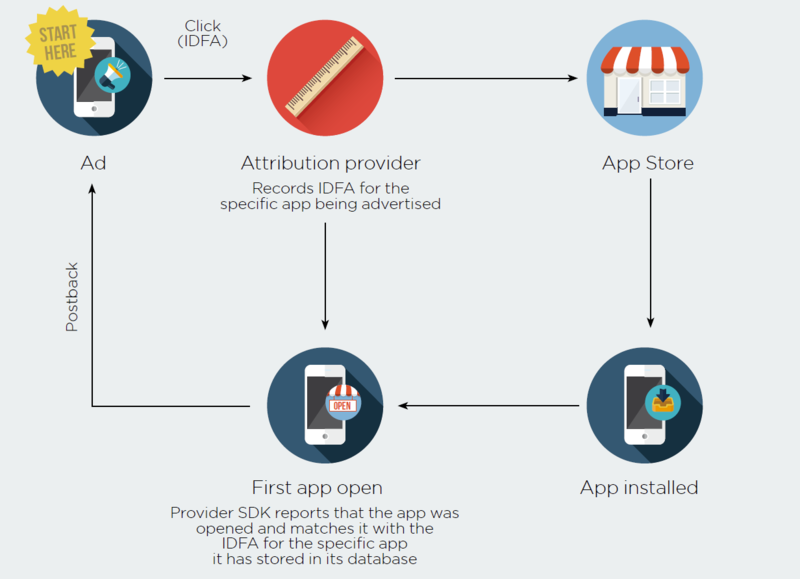 Since mobile ad networks and attribution providers are able to track individual users along their install and app usage journey via the IDFA, this identifier is critical for the mobile attribution process. Each IDFA contains no personal identifying information, or PII, instead serving to track and identify user interactions with ad campaigns, installs, and in-app activity. To track users and perform mobile attribution for specific ads and campaigns, the media source in question (and the attribution provider) must support IDFA tracking. Why is the IDFA so important to mobile measurement? IDFA is one of the most accurate means of tracking user interactions with advertisements and apps on iOS (and it is highly persistent unlike the cookie, as very few users reset their device ID). It offers a high level of privacy that emphasizes user choice. By assigning only a single ID to a given iOS device, advertisers are able to obtain more granular information about that user’s activities within a given campaign with great certainty. This process can further clarify the performance of specific advertising campaigns and help mobile advertisers optimize campaign strategies and marketing budgets. Additionally, while each IDFA is unique, it is possible for them to be reset and generally controlled from the user end. Following the evolution in mobile privacy policies over the past several years, the IDFA emerged as a more privacy-centric identifier, as iOS mobile users have been able to reset their device ID at any time since its launch. However, far more relevant to privacy and ID matching tracking, generally the primary and most accurate means of tracking mobile users via device ID, is the opt out for ad tracking on Apple devices, also known as the limit ad tracking option. iOS mobile device users can simply toggle “Limit Ad Tracking” on in their device’s privacy settings. Once selected, the iOS will send advertisers a string of zeros instead of the actual device ID, making any identification impossible. While the implications of limit ad tracking vary for advertisers themselves, this option does ensure the depersonalization of user data when relevant or desired for users. The importance of limit ad tracking for marketers should not be underestimated from a measurement perspective either, as 15-20 percent of Apple users have activated this option and are thus not available for tracking. As a note, following the implementation of GDPR regulations in May, regardless of whether or not a user has opted out of ad tracking via their personal operating system, denying consent to device ID tracking via GDPR-compliant notifications will take precedent and either remove past data or stop collection of future data per app for an IDFA from an attribution provider’s database, depending on selected user preferences.